This May 2018 satellite imagery from Washington-based Asian Maritime Transparency Initiative show minor upgrade to facilities on Pag-asa Island, one of the largest features in the Spratlys. MANILA, Philippines — The Philippines is expecting to finish the repairs of the runway on Pag-asa (Thitu) Island in the West Philippine Sea by the end of 2019, Defense Secretary Delfin Lorenzana said Friday. 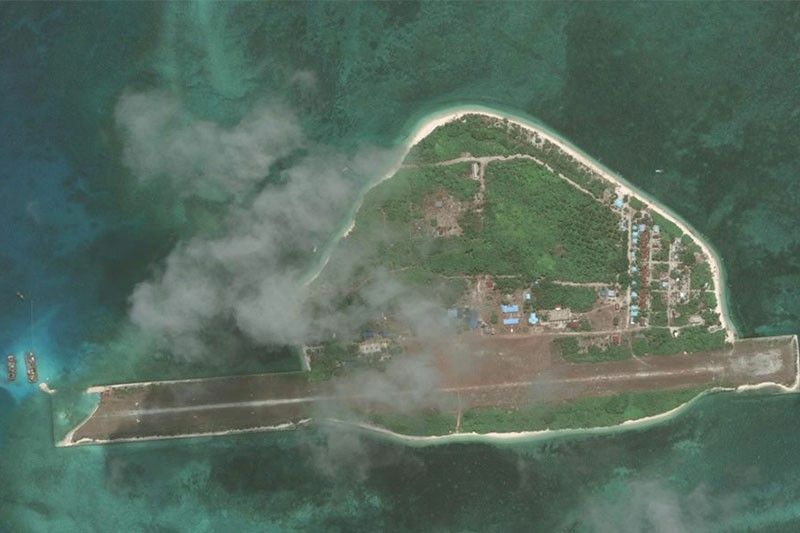 In May, Washington-based Asian Maritime Transparency Initiative released satellite imagery showing repairs have begun at the Rancudo Airfield on Pag-asa Island, one of the largest features in the Spratly Islands. Defense Secretary Delfin Lorenzana confirmed that the Armed Forces of the Philippines recently started constructing a beach ramp and a mooring bollard on the island. "When completed, these will facilitate the transport of materials for repair and concreting of the airstrip," Lorenzana said in a speech at the Pilipinas Conference 2018 in Makati City. As part of its efforts to protect national territory and uphold sovereignty, the armed forces also facilititated hydrographic reconnaissance and site survey of Mavulis Island in Batanes. This is for the construction of a fisherman's shelter on the country's northernmost island. Lorenzana stressed that the military continuously shows presence within the country' exclusive economic zone. "We have intercepted intrusions to Philippine-claimed features. Littoral monitoring detachments and littoral observatory stations provided common air and maritime operating picture in the West Philippine Sea, Philippine Rise and other parts of the Philippine territory," he said. A few weeks ago, Lorenzana revealed that Chinese Ambassador to the Philippines Zhao Jianhua tried to block the government's plan to rehabilitate structures on Pag-asa Island. "When he learned that we're going to repair our runway in Pag-asa, he came to me and said, 'No,'" Lorenzana earlier said at a maritime forum. Lorenzana answered to Chinese envoy by pointing out that it was proper for Manila to improve every facility on Pag-asa as Beijing already developed Subi Reef. China has reportedly installed surface-to-air missiles, anti-cruise ship missiles and electroning jamming equipment on Fiery Cross, Mischief and Subi Reefs.